For Group VIII, the rightmost group in the Periodic Table, see noble gas. Group 8 is a group of chemical element in the periodic table. It consists of iron (Fe), ruthenium (Ru), osmium (Os) and hassium (Hs). They are all transition metals. Like other groups, the members of this family show patterns in electron configuration, especially in the outermost shells, resulting in trends in chemical behavior. "Group 8" is the modern IUPAC name for this group; the old style name was group VIIIB in the CAS, US system or group VIIIA in the old IUPAC, European system. Group 8 should not be confused with the old-style group name of VIIIA by CAS/US naming. That group is now called group 18. 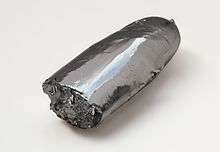 Hassium has not been isolated in pure form, and its properties have not been conclusively observed; only iron, ruthenium, and osmium have had their properties experimentally confirmed. All three elements are typical silvery-white transition metals, hard, and have high melting and boiling points. Iron has been used since antiquity to make tools. Iron has been known and used to make tools since antiquity. Ruthenium was first identified in 1844 in platinum ores, after all other platinum group metals, including Osmium, which was discovered in 1803; by dissolving impure platinum, salts were created. In a graphite-like dust always found in these salts, it was concluded that a new metal must be present, which would be Osmium. Ruthenium was first discovered in the form of ruthenium oxide in a similar manner. Hassium was discovered in 1984 by a team led by Peter Armbruster and Gottfried Münzenberg by bombarding lead-208 with iron-58. Iron is the most common element within the entire earth; most of the core is iron and there is a substantial amount of iron in the mantle and crust as well. Ruthenium and osmium are two of the rarest elements on earth, with ruthenium only found in small amounts in platinum ores. Osmium is the least abundant stable element in the earth's crust, only found in minor traces in platinum ores. Hassium is only produced in nuclear reactors and has never been observed in nature nor isolated in pure form. Iron is an essential nutrient for all living organisms, from archaea to humans. It is a major component in hemoglobin, a protein that makes blood red and transfers oxygen to muscles, and is also found in many other proteins. Ruthenium, osmium, and hassium have no known role in the human body.